I love learning new techniques. One of the things I like so much about knitting is the number of techniques to learn. Like entrelac, Norwegian purling, Portuguese knitting, colorwork… every time I worry that I’ve learned it all, something new pops up! 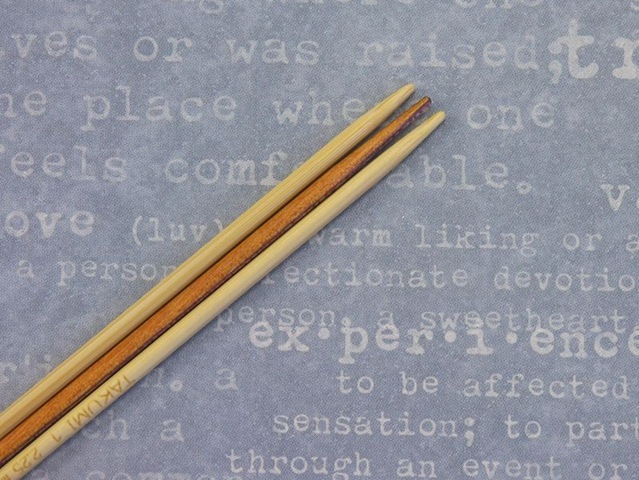 The story of how I stumbled on this new technique is long and boring, but I will tell it to you anyway. I’m just that kind of person. I was poking around on Abby Franquemont’s YouTube channel for some spinning videos about a week ago. One of the videos there was this one of the Yarn Harlot knitting and explaining a bit about her technique, particularly how it’s better for preventing repetitive stress injury. I watched the video and marveled at her speed. “Isn’t that cool?” I thought. Then I didn’t think much about it for a while. 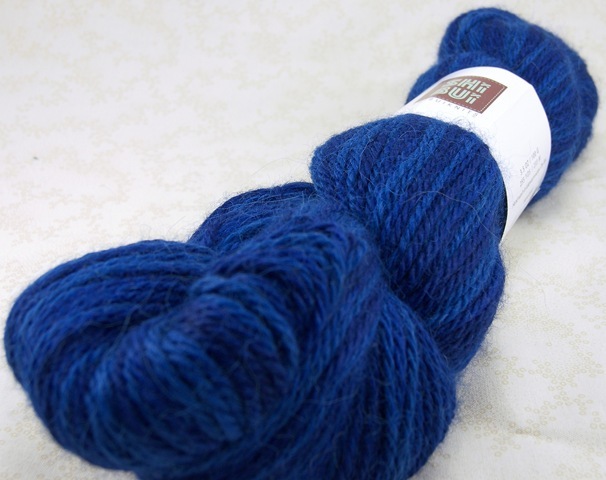 A week went by, and I saw on the Harlot’s blog that she had finished another pair of socks. Now, this woman is always traveling, teaching, writing, and has teenagers at home. How is it that she can churn out multiple projects in the time it takes me to finish one (not one project, one sock)? It dawned on me. She is using that other knitting technique. I watched the video again and paid attention to the name. Irish cottage knitting or production knitting. 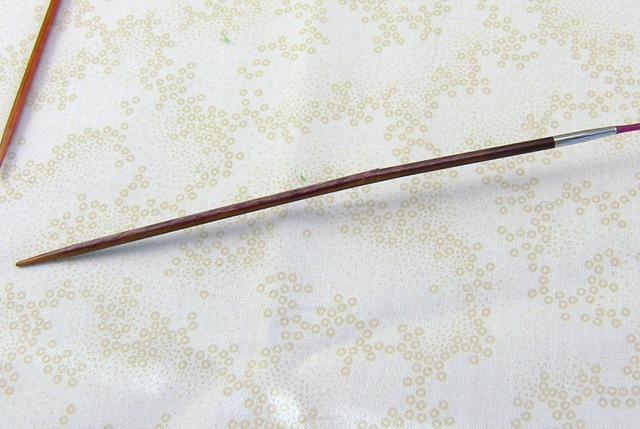 Also known as lever or armpit knitting. Well, that set off a full-blown Google search for anything and everything that I could learn about Irish cottage knitting. This is the technique that the Harlot teaches in her class about knitting efficiency. I missed out on that class at the Sock Summit (it sold out fast!!) so I’ve tried to piece it together online. There isn’t actually a ton of info about it out there. 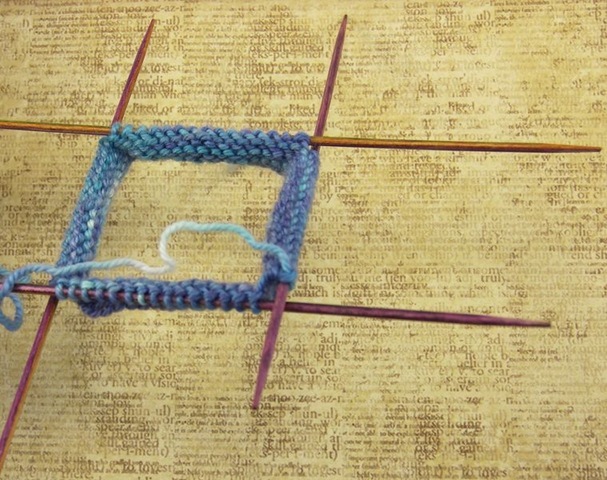 It’s a bit of heritage knitting; not taught much anymore unless you are taught by someone who knits that way. I mean, I have seven thousand books on knitting and I’ve never seen it really mentioned before! There’s a brief description in the Art of Fair Isle Knitting and the History of Handknitting, but no pictures or instructions. So, I believe that I have indeed recreated this technique. I’ve been practicing so much that I’m almost as fast cottage knitting as my regular knitting! Hopefully after some more practice, I will reach actual speed-knitting speed. This is the technique that the world’s fastest knitters use! It would be very nice to be able to churn out more projects… I have so many ideas for designs but I’m limited by the speed of my knitting. So, we’ve got the above video. Then there’s this one, which has a slow motion section and an analysis of the way Stephanie holds her needles. 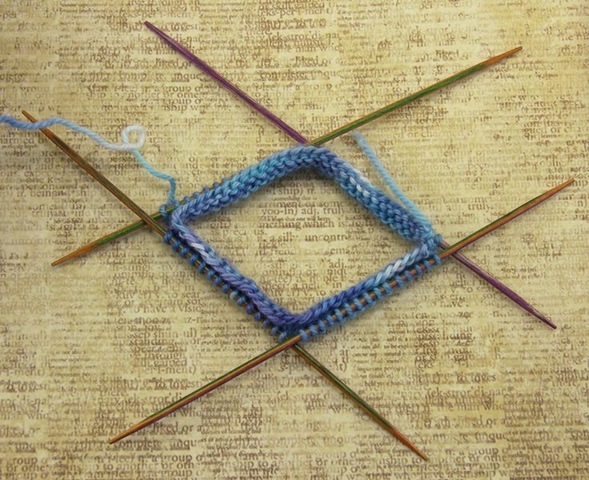 Then there’s some good info on the Ravelry group about cottage knitting. Once I’m sure that what I’ve come up with is indeed cottage knitting and really is faster, I’ll post up a tutorial about the technique! And this one is just plain funny whether you’re a knitter or not. And especially if you’ve visited Denver. I’ve been knitting for three years now (well, knitting seriously) and I’d never broken a needle or even chipped one in that time. And now I’ve broken two in short succession! This time it’s not so crushing, since I broke a Size 1 needle and I have tons of those. But seriously, knitting gods?! I had to break another needle? This time I’m not even sure I know how it happened. I had taken my knitting on some errands with Lowell. When we got home, I had my hands full of goodies and my knitting bag slung over my shoulder. I took off my shoes and came through the door. I slammed my foot into something sharp, which led to some jumping around, yelping, and dumping of goodies onto the floor. I figured that I had stepped on a small stick or something on the welcome mat. I put away the goodies and went back to look at the mat so that Lowell wouldn’t step on it too. I found some shard of something that looked suspiciously like a Harmony needle. But that couldn’t be- my knitting was carefully stowed in my knitting bag! I check my knitting, and there was a shattered needle hanging out of the bag. I still don’t know how it happened. How did my knitting jump out of my bag? How did it get to the floor without my noticing and postition itself just right to get stepped on? It must have wanted to be broken! Do I have suicidal needles? I thought needles like to be used. Why would my favorite pair of needles jump to certain doom? I don’t understand. Clearly this wasn’t my fault. I had everything put away nicely. 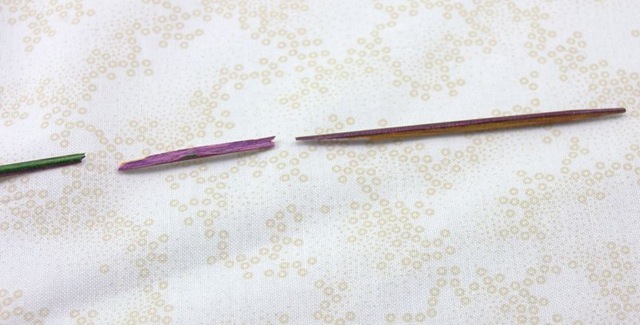 This needle wanted to be broken. I feel terrible for its twin on the other end of the cable. What must it be thinking? Abandoned by its sibling and now useless to me. That’s a terrible burden for a tiny needle. Maybe I need a needle whisperer. Or could this be a case of the rare needle flu? I should go quarantine the other circulars; hopefully they’re not already infected! I know when I’m licked. This is the hazard of placing your project down anywhere near your feet. Normally, this would be cause for some cursing, a brief memorial service, and then a transfer of the project to DPNs while I wait for a new Harmony circ. Like most of my life recently, this is has not happened under normal circumstances. There was a lot of cursing. I have at least 3 pairs of size 1 circulars. And at least 4 sets of size 1 DPNs. I have slightly fewer combinations of size 0s and just enough size 2s to cover this sort of occurrence. But turn me ’round and call me Nancy if this sad horrific accident didn’t happen to my only pair of size 1.5 circulars! See, I tried to start some socks using Shibui Knits on size 1s. They were very dense and had very little give. Then I tried them on size 2s, which ended up too loose and sloppy for my tastes. So I went and grabbed Baby Bear’s needles and darn if size 1.5s (2.5mm instead of 2.25; often they’re just referred to as size 1s) weren’t just right. Everything was going smoothly, including a very fast stockinette section that was very enjoyable. Then I had to frog. About 30 rounds. And then I had a tangled mass of yarn to lug around as I dragged the project around to various engagements. And now this. I’m beginning to think that this sock doesn’t want to have cables on it. It’s very picky, as this is the second attempt I’ve made at using this yarn. I haven’t posted in a while, because really there hasn’t been a lot of knitting this week. I fell off my bike (I got clipless pedals and everyone has to fall once with them. I was smart and managed to fall on the grass.) and tweaked an old injury that hurts when I knit. And there’s been a lot of spring cleaning. And every time I sat down to post, I got writer’s block. I’ve been dealing with some depression and anxiety lately. 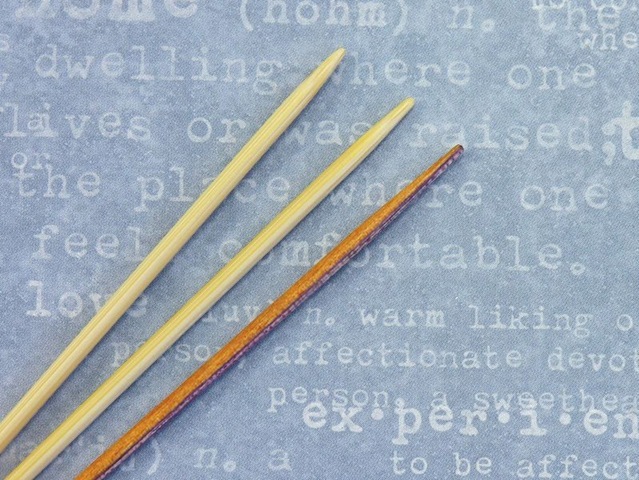 I don’t want to go into too much since this is a crafting blog and not a inner-psychosis blog. But it’s been keeping me from really enjoying writing like I usually do, so I feel like I should mention it. I’ve been trying very hard to lose weight for a while. No one’s sure right now why, since I’m following every instruction I’ve been given, I’m not making any progress. The current theory is some sort of rare syndrome. It’s very frustrating to have made all these changes in my life and to be popping supplements and pills left and right and to not know what’s wrong with me. It will all be resolved; as Lowell says I can’t outrun the laws of science forever. But right now it’s hard and stressful. There’s a lot to keep track of. On the plus side, I have found a lot of new foods that are incredibly delicious. And the clipless pedals are not as scary as I thought they would be. Guess I’ll go put the Shibui Knits in the corner and see if it ever comes around and tells me what it’s supposed to be. Luckily, I have other socks to work on. I took pictures for a tutorial today, so hopefully the next post will actually be something useful! I hope everyone has a happy and delicious Thanksgiving! Lowell and I headed back to Virginia for Thanksgiving with my family. The only good thing about the plane flight was the uninterrupted, pure knitting time. The bad part was that I was in the middle seat (we take turns in the middle and previous flight I got the window) and I’m kind of obsessive about not impacting the person next to me, unless it’s Lowell. I developed an interesting twitch after sitting hunched over for 4 hours trying to knit a sock. It’s okay, though, because the sock is lovely. 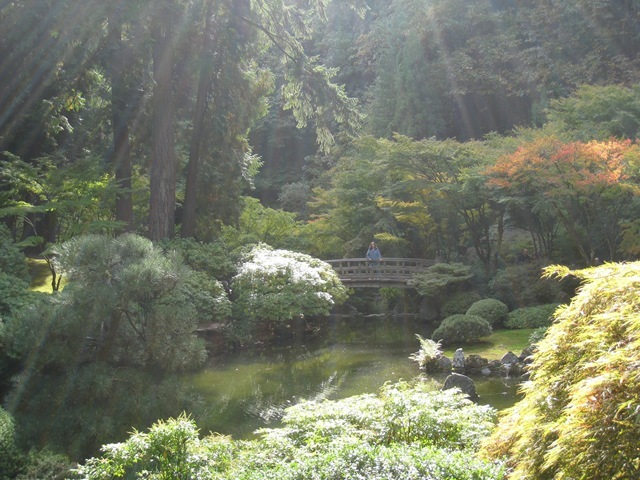 Can’t show it to you, though, because if it continues to be lovely, it’s going to be submitted to Knitty. Last night, I went digging through the family room to see if I could find any of my old knitting. I dug through tons of stuffed animals, searching for any of the doll blankets that I had made. All I got was a lot of sneezes. I was worried that all of the old knitting had gotten lost or disintegrated, although I’m not sure Red Heart Super Saver biodegrades. 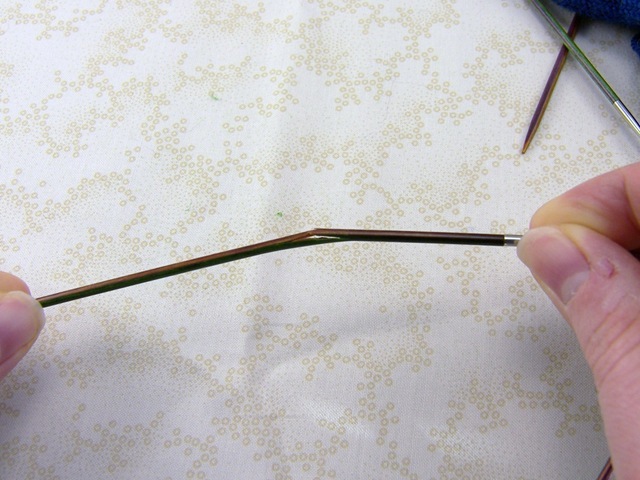 I settled on finding my old needles and was happy to find that there were still some scraps of knitting on the needles! It was really fun going through my old knitting things. 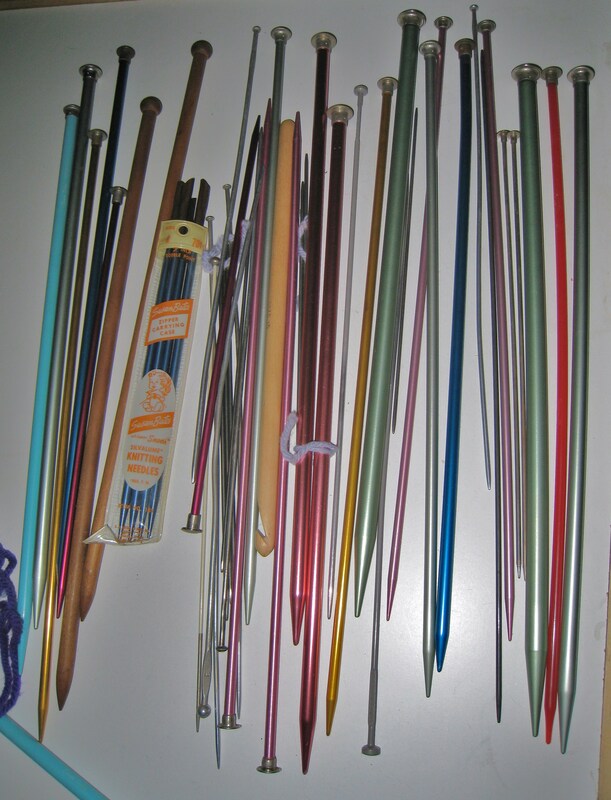 My mom gave me all her old knitting/crochet needles when I learned to knit around 9 or 10. 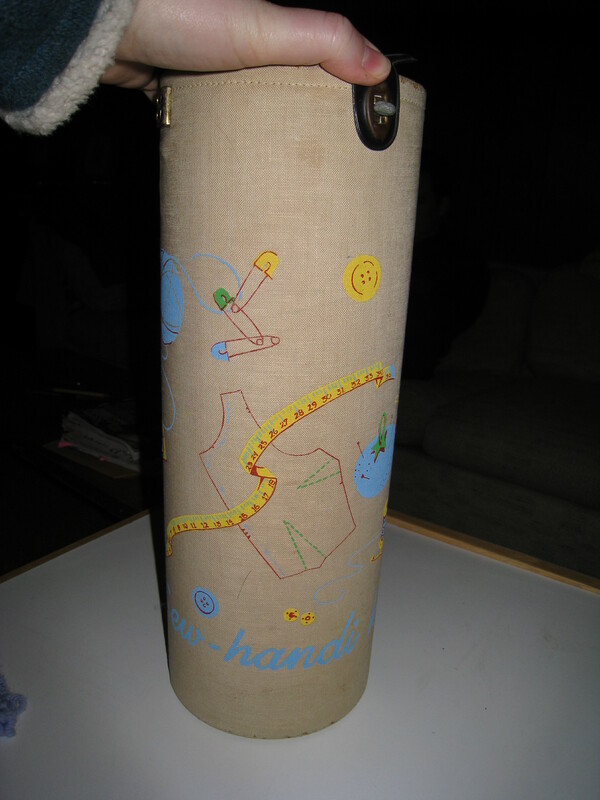 The needles were all kept in this great tube with a little latch at the top. The center of the lid had a hole in it, which at the time confused me but I assumed it was to allow taller needles to fit in the tube (you could let them stick out the top). Now I know that the hole is for the yarn, like these new containers, but I remember puzzling over it for a long time. Another thing that confused me was the DPNs. I didn’t know why some of the needles were very short and didn’t have stoppers at the end. And, what really confused me, was why in the world were there four of them? I thought that you were supposed to pair them up and keep the others as spares! 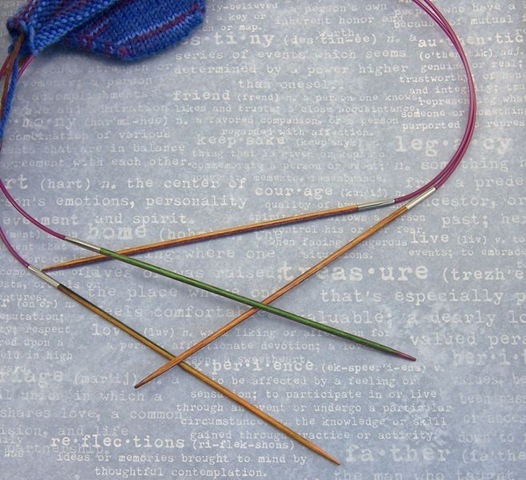 I would tie pairs of needles together with scraps of yarn so that all the pairs were together. I divided the DPNs up into pairs and tied them together. Not all of the needles had matches, which bugged me to no end. (Look at those DPNs… the one in the middle is the world’s longest DPN, I swear!) I remember being very amused at the little needle protectors, although I didn’t know that’s what they were. They’re very squishy rubber and they only cover the very tips of the needles. The rest of the cover just flops around. 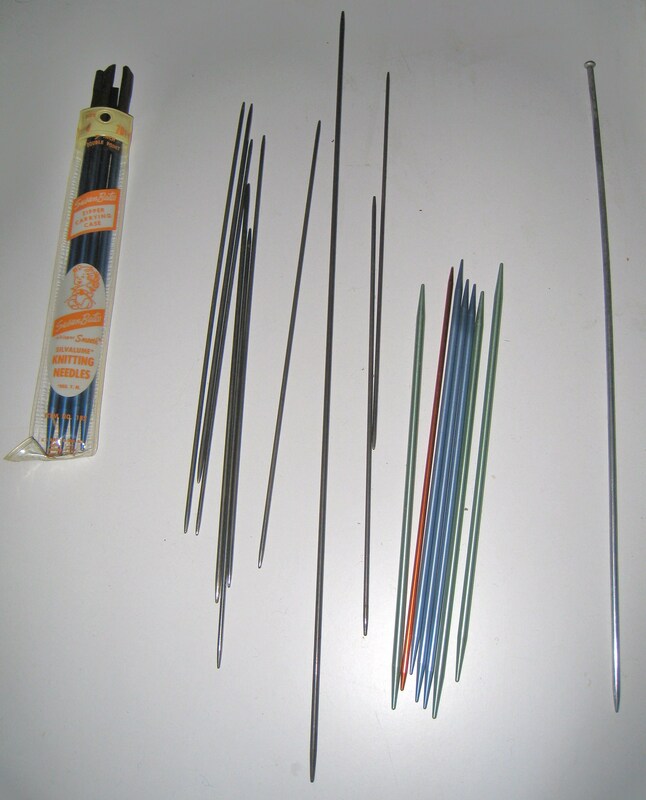 I had one pair of needles that was bought just for me and those were always my favorites. I tended towards the plastic needles over the aluminum ones, because I didn’t like how cold and hard the needles were in my hands. I always chose color over material, though. 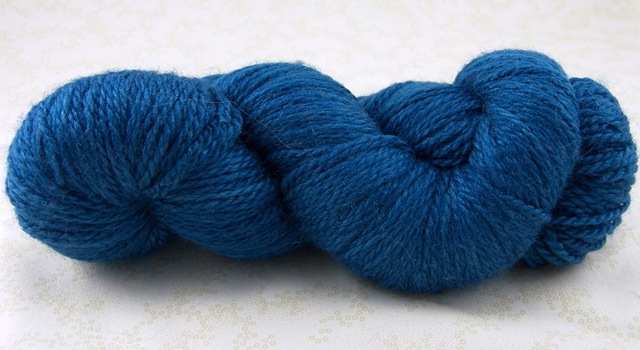 If I wanted to knit with blue needles, then I’d pick up some aluminum ones. Now, I can’t stand plastic needles and only somewhat tolerate aluminum. Ah, how things change. On to the knitting. 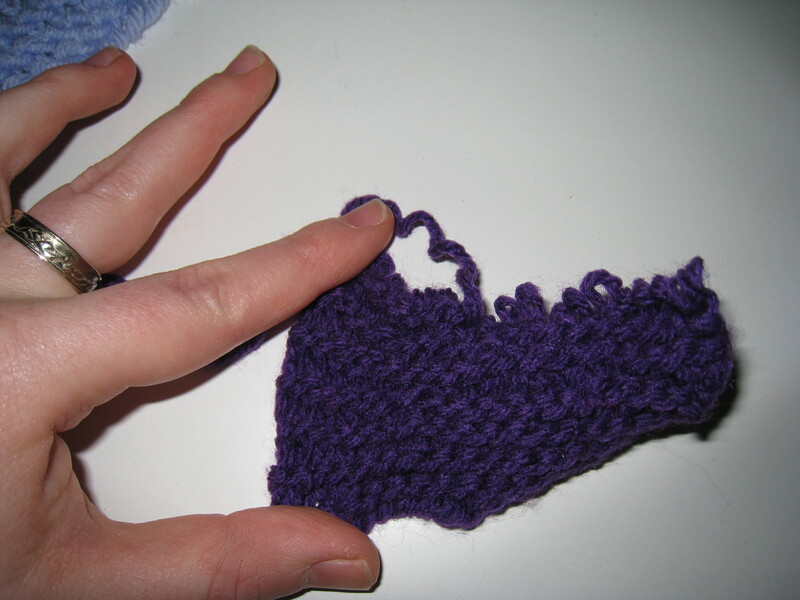 When I relearned knitting a few years ago, I kept knitting into the back of the stitch. It felt more natural. Well, that’s apparently because I was knitting all my stitches twisted as a kid. These pictures are awful, but I don’t have a lightbox or more importantly a tripod. Look at that lovely cast on edge there, cast on with the backwards loop method. All garter stitch, all twisted. In a nice pastel purple Red Heart acrylic. Still on the needle, even! This piece is interesting. It appears that I accidentally did some short rows. One of the reasons that I quit knitting as a kid was because I could only stop at the end of a row, which was inconvenient. If I put the needles down mid-row, I had no idea which needle had been in my right hand. Here, I obviously picked up the knitting mid-row and continued working, having no idea (or maybe just a sneaking suspicion) that I was knitting the wrong direction! 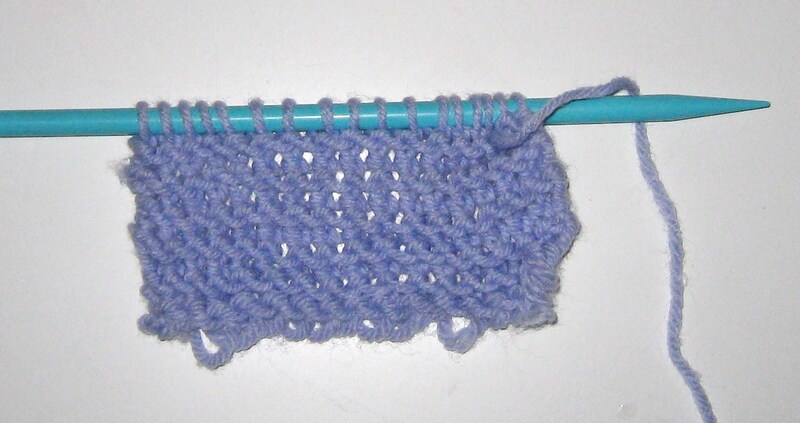 I don’t remember ever learning how to purl. But this piece proves that I must have because here, in all it’s twisted glory, is a tiny swatch of stockinette. This might have been near the end of my knitting as a kid, because the cast on is much nicer, but the piece is smaller. 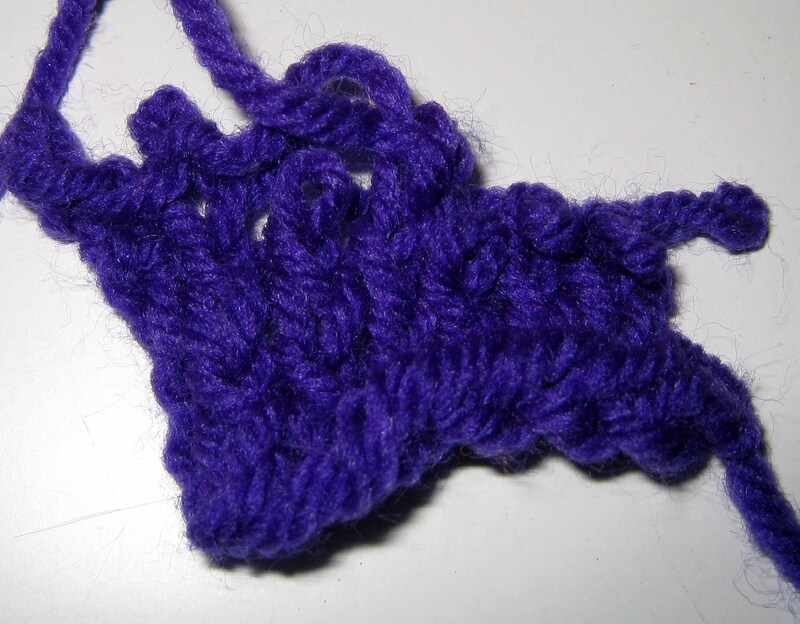 Towards the end, I was knitting smaller pieces and sewing them together into small “blankets”. Going back to my knitter roots was a lot of fun. Because of the long gap between knitting crazes (almost 15 years!) these swatches almost seem like they belong to someone else. It was amazing how many memories came back when I opened the tube of needles. I wish I could find some of my finished “blankets,” but these little pieces are enough.